Alert! :: Please note that I have a new website: kristinshieldsart.com. Come check it out! Kristin Shields was born in Colorado, grew up in Connecticut, Maryland and Massachusetts, moved to California for college, and later spent one amazing year in Hawaii. Since 2004, she has lived in the high desert of Central Oregon. She is a wife and mother of two young adults. Kristin majored in Biology and has a Master's degree in Avian Sciences. She started quilting in 1991, shortly before her children were born. Quilting was a wonderful creative outlet for a young mother. As her children grew, Kristin and her husband decided to homeschool them and quilting continued to be her main creative pursuit. Kristin's work has evolved from traditional designs to liberated/free-pieced/improvisational piecing and original applique design. You will find that birds appear frequently in Kristin's work. Kristin discovered the work of Gwen Marston in 2002 while living in Hawaii. She still remembers the utter amazement she felt as she looked through Gwen's original Liberated Quiltmaking book. She considers herself lucky to have found Gwen when she did because her work was forever changed. In 2004 she moved to Bend, Oregon, in the heart of the quilter's mecca of Central Oregon. She had no idea how much this move would change her life as well. She was very fortunate to be able to meet Gwen Marston and take classes from her during Quilter's Affair in Sisters. In 2013 Kristin was able to travel to Michigan to participate in Gwen's final year of teaching at her Beaver Island Quilt Retreat. It was an experience that she will never forget. With Gwen's encouragement Kristin's classes are structured in the concepts of Liberated Quiltmaking and helping students create their own original work. One of the most exciting days in the life of a quilter is being honored by fellow quilt artists. In 2013 Kristin was the featured quilter at the Sisters Outdoor Quilt Show, the largest quilt show in the world. It was an amazing day and you can see her delight in the photo above. Kristin belongs to the Mt Bachelor Quilters' Guild, the Central Oregon Modern Quilt Guild, Studio Art Quilt Associates and The Undercover Quilters Book Club. She has been making book inspired quilts since 2010. Kristin continues to work in her home studio facing the Deschutes River in Bend, Oregon. Her focus for 2015 is on liberated quilts in solids and the book quilts that have become an important part of her body of work. 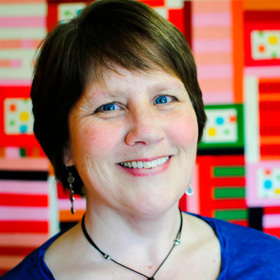 She is available to teach for guilds, groups, retreats and shops and seeks to share her love of color, improv and liberated quilts with quilters everywhere. Kristin's other interests include travel, mixed media art, photography, reading, birding, hiking, mountain biking and cross country skiing. 2014, Minimal Quiltmaking by Gwen Marston, 2 quilts: Minimal Purple and Iris Dreams. 2014, The Men Behind the Quilts Calendar, Sisters Outdoor Quilt Show, collaborative quilt with The Undercover Quilters.